For any musician, a record deal offer is a dream come true. But if you don’t read the key clauses, your label could undercut your band. Here’s your guide to record contracts and how to negotiate the terms. It’s every band’s dream that a talent scout will approach you after a show and offer you a record deal. If you’re like most musicians, you likely daydream about this scenario, planning all your future record deals and all the stops you want to make on tour. Most bands don’t get to make this dream a reality. If you’re reading this, you’re probably one of the lucky few who get to. Record label contracts are intense, though. You’re going to need to do your homework if you want to come out the other side with a record deal that doesn’t undercut you. Keep reading to learn everything you need to know about negotiating your new record deal! First things first, you’re going to need to find an attorney to help you negotiate your record deal. Entertainment industry legal jargon can be confusing to navigate on your own. You can try, but you’re likely going to miss a beat, which could be bad for you in the long run. If this is your first record deal, you probably won’t need to hire an attorney to keep on retainer. That’s more for big bands that need regular legal counsel. Instead, you likely just need a one-time service of contract negotiation. A good lawyer will accompany you to all negotiation meetings. Check out this website to find a contract negotiation service to make sure you’re crossing your T’s and dotting your I’s on your new record deal. Royalties are the main way an artist is paid through a recording contract. You might think that the artist will receive most of the dough, and the recording company will get a small cut, right? Wrong. Artists typically only make between 10-20% of every record sale. This is where managed expectations come in. If you expect to sell 100,000 copies of your album at $10 per pop, your band will make $100,000-$200,000. That’s pretty awesome. If your album sells way fewer copies, though, you’re going to be disappointed in the amount you make from all the hard work you put in to write and record your album. That’s why you need to negotiate the highest percentage of royalties you can manage. Keep in mind that recording companies frequently take packaging costs out of artist royalties, too, making it even less than what you’d think! A multi-album record contract might seem like a dream come true–and it can be–but these deals require special care and attention that one album deals don’t. If you don’t like the way your contract pans out after album one is dropped, imagine having to do that two or three more times. Many recording companies will include options to renegotiate contract terms after each album, but some don’t right off the bat. If you do sign a multi-album deal, just be sure that there’s language in your contract specifying that you’ll be able to renegotiate your contract after each and every album if you want. 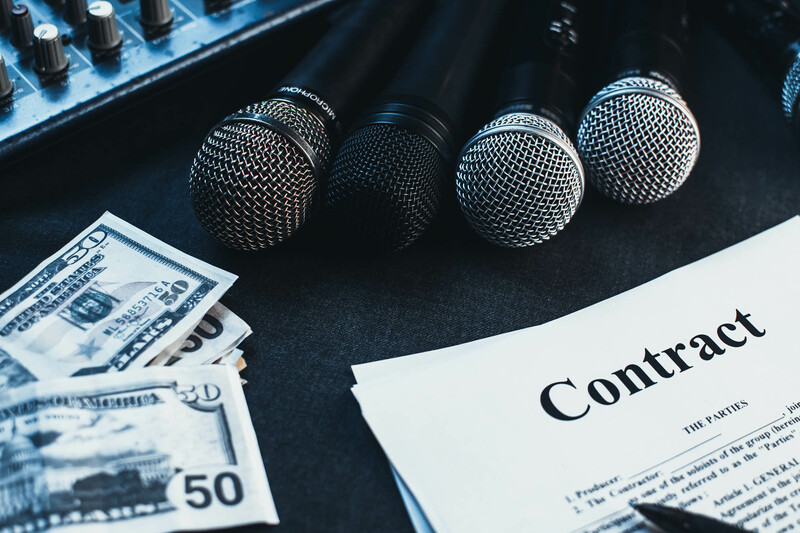 If you’re one of the lucky bands out there that’s scored a record deal, hopefully, this guide will help you navigate the murky waters of negotiating your record contract. A music record deal is one of the most difficult contracts out there to negotiate, so save yourself some trouble and hire a lawyer right off the bat. Want to read more about the world of art? Check out our other art articles here!